Moving your videos from your PC to your iPhone doesn’t have to be a hassle. At first, you might be annoyed by the limitations that iTunes imposes, but there are easy ways to get around this, actually. Let’s take a look at an alternate way to transfer your videos and then compare the two methods. iMyFone TunesMate iPhone Transfer is a tool that allows you to move all kinds of media from your PC to your iPhone directly, and vice versa. You can transfer music, photos, videos, and more in just a few minutes. Directly drag and drop the videos from PC to iPhone. Transferring videos from PC or iTunes to iPhone without any damage to the existing videos. You can transfer any kind of video that you want, even videos that you didn’t purchase from the official iTunes store. TunesMate automatically converts videos during the transferring process so that they can be played on your iPhone. Step 1. Download TunesMate and install it on your PC. Connect your iPhone to your computer via USB. Step 2. Open up TunesMate and then click where it says Videos at the top. Step 3. You will see a list of videos on your device. 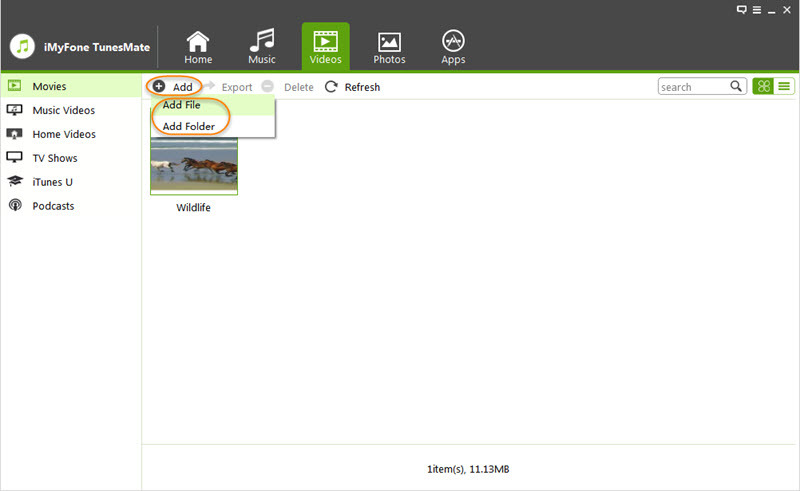 To add more videos from your PC, click Add > Add File (or Add Folder, if you want to add a whole folder). Step 4. Browse for the video file (or folder) that you want, then click open. Add videos to iPhone directly from PC, Mac, iTunes, external hard drive, MP4 player, etc. Rebuild or restore your iTunes library or your iTunes purchases, even without opening iTunes. Share your music, videos or playlists with friends, even if they have a different Apple ID. 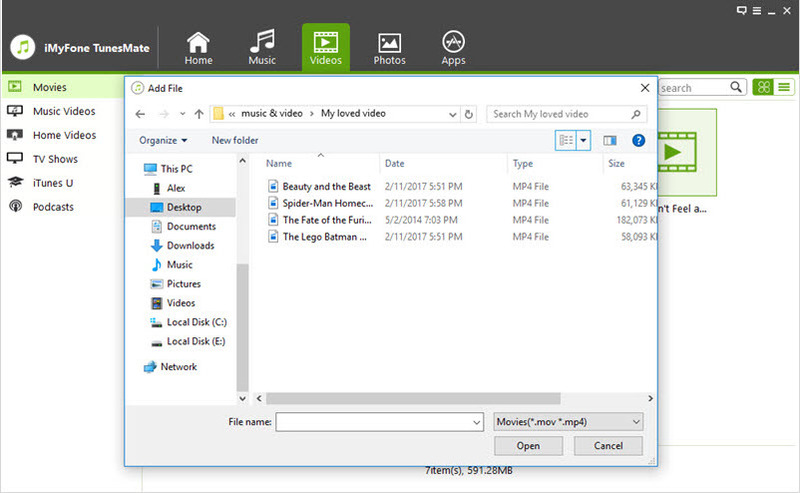 Extract media files from iPhone to computer, external hard drive, iTunes, etc. Step 1. Open iTunes, then go to File > Add File to Library. Step 2. Browse for the video or videos that you want to eventually transfer to your iPhone. Step 3. Once those videos are added to the library, connect your iPhone to your computer. Step 4. Click on the device icon when it shows up. Step 5. Go to Movies tab from the left sidebar. Step 6. Check Sync Movies and select the videos. Step 7. Once done, tap on Apply button. If you sync, it can overwrite the library that was already on your iPhone. You can only transfer to devices with the same Apple ID. You can only transfer video in certain formats. If you won’t sync it in the right way, your iPhone will be erased. It can extract files from iPhone to iTunes or computer. 3. Should We Transfer Videos without or Using iTunes?